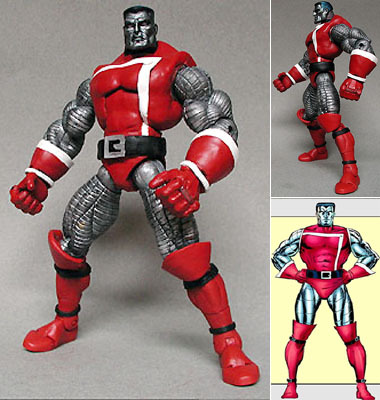 This version of our favorite Soviet X-Man came about in the 1980s and reflects a more 'USSR' feel. I first removed all the excess plastic from the Marvel Legends Colossus and applied Magic Sculpt resin to smooth out the chest, shoulder and hands. The shoulder pads had to be clipped and patched over with resin, too. I then built up the gloves using resin and trimmed the edges with an X-Acto knife as it dried. This technique leaves a clean edge and you can usually snap the excess off after it dries. The buttons on the vest are small pieces of cut vinyl as are the knee pads and vest edges. The belt was Dremmeled down and filled with resin and the new belt buckle is cut from vinyl. After all the resin work was done, I glued straps on the boots and wrists, closed the gaps with resin and cut the edges with an X-Acto. I used a flat red, black and white and touched up the armor with a dry-brushed silver highlight and metallic blue for his hair. Once the painting was complete, I sealed the figure with Dullcote. Do you remember this costume? Like it or the regular one better? Tell us on our message board, the Loafing Lounge.